A season is one of the major divisions of the year, generally based on yearly periodic changes in weather. In temperate and polar regions, four seasons are generally recognized: spring, summer, autumn or (fall), and winter. In some tropical and subtropical regions, where the amount of precipitation varies more dramatically than the average temperature, it is more common to refer to a rainy (or wet, or monsoon) season and a dry season. In other tropical areas, three types of seasons are recognized: hot, rainy, and cool. In some parts of the world, special "seasons" are loosely defined, based on significant phenomena, such as a hurricane season, tornado season, or a wildfire season. This is a diagram of the seasons. Note that, regardless of the time of day (that is, the Earth's rotation on its axis), the North Pole will be dark, and the South Pole will be illuminated; see also arctic winter. In addition to the density of incident light, the dissipation of light in the atmosphere is greater when it falls at a shallow angle. 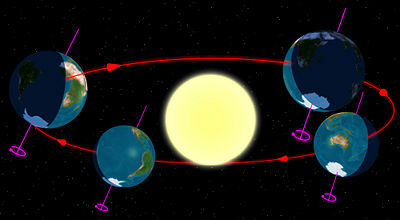 The seasons result from the Earth's axis being tilted to its orbital plane; it deviates by an angle of approximately 23.44 degrees. Thus, at any given time during summer or winter, one part of the planet is more directly exposed to the rays of the Sun (see Fig. 1). This exposure alternates as the Earth revolves in its orbit. At any given time, regardless of season, the northern and southern hemispheres experience opposite seasons (see Fig. 2 and Month ranges of seasons, below). Seasonal weather fluctuations also depend on factors such as proximity to oceans or other large bodies of water, currents in those oceans, El Niño/ENSO and other oceanic cycles, and prevailing winds. In the temperate and polar regions, seasons are marked by changes in the amount of sunlight, which in turn often causes cycles of dormancy in plants and hibernation in animals. These effects vary with latitude, and with proximity to bodies of water. For example, the South Pole is in the middle of the continent of Antarctica, and therefore a considerable distance from the moderating influence of the southern oceans. The North Pole is in the Arctic Ocean, and thus its temperature extremes are buffered by the presence of all that water. The result is that the South Pole is consistently colder during the southern winter than the North Pole during the northern winter. As the Earth revolves around the Sun, the seasons in the northern and southern hemispheres are opposite. The cycle of seasons in the polar and temperate zones of one hemisphere is opposite to that in the other. When it is summer in the Northern hemisphere, it is winter in the Southern hemisphere, and vice versa, and when it is spring in the Northern hemisphere it is autumn in the Southern hemisphere, and vice versa. In the tropics, there is no noticeable change in the amount of sunlight. However, many regions (famously the northern Indian Ocean) are subject to monsoon rain and wind cycles. Curiously, a study of temperature records over the past 300 years (David Thompson, Science, April 1995) shows that the climatic seasons, and thus the seasonal year, are governed by the anomalistic year rather than the tropical year. 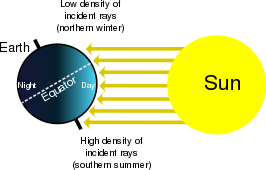 In meteorological terms, the winter solstice and summer solstice (or the date maximum/minimum insolation) do not fall in the middle of winter and summer respectively. The heights of these seasons occur up to a month later due to seasonal lag. Seasons though, are not always defined in meteorological terms (see Reckoning below). A common misconception is that, within the Arctic and Antarctic Circles, the sun rises once in the spring and sets once in the fall; thus, the day and night are erroneously thought to last uninterrupted for 183 calendar days each. This is true only in the immediate region of the poles themselves. What does happen is that any point north of the Arctic Circle or south of the Antarctic Circle will have one period in the summer when the sun does not set, and one period in the winter when the sun does not rise. 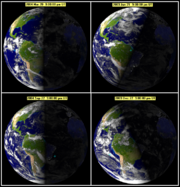 At progressively higher latitudes, the periods of "midnight sun" (or "midday dark" for the other side of the globe) are progressively longer. For example, at the military and weather station called Alert on the northern tip of Ellesmere Island, Canada (about 450 nautical miles or 830 km from the North Pole), the sun begins to peek above the horizon in mid-February and each day it climbs a bit higher, and stays up a bit longer; by 21 March, the Sun is up for 12 hours. However, mid-February is not first light. The sky (as seen from Alert) has been showing twilight, or at least a pre-dawn glow on the horizon, for increasing hours each day, for more than a month before that first sliver of sun appears. In the weeks surrounding June 21, the sun is at its highest, and it appears to circle the sky without ever going below the horizon. Eventually, it does go below the horizon, for progressively longer and longer periods each day until, around the middle of October, it disappears for the last time. For a few more weeks, "day" is marked by decreasing periods of twilight. Eventually, for the weeks surrounding December 21, nothing breaks the darkness. In later winter, the first faint wash of light briefly touches the horizon (for just minutes per day), and then increases in duration and pre-dawn brightness each day until sunrise in February. In astronomical reckoning, the seasons begin at the solstices and equinoxes. The cross-quarter days are the midpoints of the Astronomical seasons. 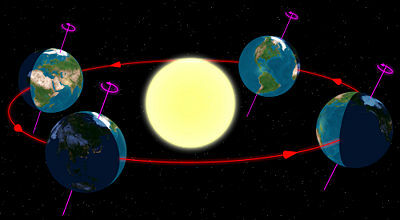 The length of these seasons is not uniform because of the elliptical orbit of the earth and its different speeds along that orbit (see Kepler's laws of planetary motion). Meteorological seasons are reckoned by temperature, with summer being the hottest quarter of the year, and winter the coldest quarter of the year. Using this reckoning, the Ancient Roman calendar began the year and the spring season on the first of March, with each season occupying three months. This reckoning is also used in Denmark, the former USSR, and Australia. In modern United Kingdom and Ireland there are no hard and fast rules about seasons, and informally many people use this reckoning. The four season mahjong tiles on the right and the four flower tiles on the other side. The flower tiles are arranged in accord to their growing seasons. 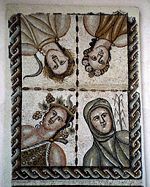 Personifications of the Four Seasons are a frequent theme in Roman mosaics, like this from Complutum. Traditional seasons are reckoned by insolation, with summer being the quarter of the year with the greatest insolation, and winter the quarter with the least. These seasons begin about four weeks earlier than the Meteorological seasons, and 7 weeks earlier than the Astronomical seasons. In Traditional reckoning, the seasons begin at the cross-quarter days. The solstices and equinoxes are the midpoints of these seasons. For example, the days of greatest and least insolation are considered the "midwinter" and "midsummer" respectively. This reckoning is used by various traditional cultures in the Northern Hemisphere, including East Asian and Irish cultures. Autumn on 3-10 Aug, Lughnasadh, 立秋 (lìqiū). In Australia, the aboriginal people defined the seasons by what was happening to the plants, animals and weather around them. This led to each separate tribal group having different seasons, some with up to 8 seasons a year. However, most modern Aboriginal Australians follow the Meteorological Seasons. In winter, the plant can't hold the leaves without chlorophyll. In spring, the plants produce chlorophyll and start to grow again. In summer, the plants grow. Usually at this time the plants completely mature. In autumn, the trees stop making Chlorophyll and turn yellow or shades of orange and red then drop their leaves. All links retrieved August 26, 2015. Why the Earth has seasons article on h2g2. This page was last modified on 26 August 2015, at 16:11.